St. Louis County Councilman Sam Page, right, says a federal subpoena was issued seeking information about the administration of St. Louis County Executive Stever Stenger, left. Updated 2:20 on Monday with news of St. Louis Economic Development Partnership subpoena. A federal subpoena was issued last week seeking information about St. Louis County Executive Steve Stenger’s administration. One particular focus was how Stenger’s administration issued contracts, which has been a source of contention for months between the Democratic chief executive and the council. Councilman Sam Page, D-Creve Coeur, told the St. Louis Post-Dispatch that a federal grand jury issued a subpoena to St. Louis County. Page read the subpoena during a meeting with St. Louis County Counselor Peter Krane last week. Among other things, the subpoena sought Stenger’s call history, texts and emails with employees regarding contracts. The subpoena also requested information from seven members of Stenger’s staff and information on county contracts — including sale of Wellston industrial parks to people who contributed money to Stenger’s campaign. Page confirmed the subpoena information to St. Louis Public Radio on Sunday but was unavailable to talk further. Councilman Ernie Trakas said he spoke with Page about the subpoena shortly after his Friday meeting with Krane. Trakas said that Page told him that subpoena also sought recordings and minutes from council meetings and hearings. Trakas, R-South St. Louis County, is the chairman of a committee looking into a deal to move some county operations to Northwest Plaza in St. Ann. 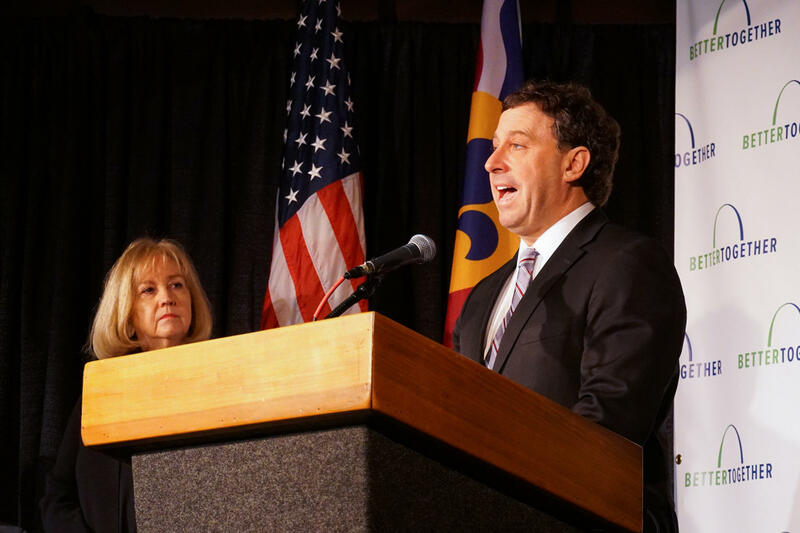 In a statement issued on Monday morning, Stenger said "with respect to the issuance of a subpoena to county government, we intend to provide all of the information requested and cooperate fully." Stenger’s adversaries have long accused him of granting contracts to campaign donors. For instance: Mark Mantovani made the Northwest Plaza deal a major emphasis of his unsuccessful 2018 Democratic primary campaign. Stenger also came under fire for how he interacted with the St. Louis Economic Development Partnership. In a statement released on Monday afternoon, Partnership Chairman Karlos Ramirez said his agency received a subpoena "seeking records from the Partnership and related entities." "While we cannot comment on any particular investigation, we are committed to full cooperation with authorities and transparency with the public," Ramirez said. "We are proud that our organization is one of the first combined efforts of St. Louis city and St. Louis County, and are committed to ensuring we can focus on our mission in the most efficient and effective way possible." Stenger has publicly denied giving out contracts based on whether someone donated to his campaign — most recently on a March 7 edition of St. Louis on the Air. Trakas, though, said this development is troubling for St. Louis County government. Stenger was recently sworn in for a four-year term in January. Before he was elected to the St. Louis County Council last year, Tim Fitch served as the county police chief and under then-County Executive Charlie Dooley’s tenure, talked to the FBI about an investigation into a subcontract to build the county crime lab. While emphasizing he’s not seen the Stenger subpoena, Fitch said local authorities had to get approval from Washington, D.C., officials before doing anything on the crime lab contract, because it was dealing with an elected official. “Because really, issuing the subpoenas is not the start of the investigation — it’s just part of the investigation,” Fitch said. In the case of the crime lab, Fitch said there was a roughly eight-month time period between subpoenas being issued — and then-U.S. Attorney Richard Callahan deciding not to bring charges against Dooley or anyone in his administration. “Typically when they issue subpoenas, they have some reason to believe there could be something amiss,” Fitch said. “However, as in the crime lab case, the U.S. Attorney, who was a Democrat and so was Charlie Dooley, basically said there wasn’t enough evidence to issue any charges on anybody. And what I had said back then, and I’ll say it again is any kind of investigation, this case included, it’s either to find if anyone violated any criminal laws or clear them of it. “Just because you’re doing an investigation doesn’t mean they’re guilty of any crime violation,” he added. Under Better Together's proposal, St. Louis County Executive Steve Stenger would serve as the mayor of a united St. Louis metro government until 2025. Page's revelation wasn't the only news story on Sunday that affects Stenger's political future. Stenger was slated to become the first "metro mayor" under Better Together's plan to merge St. Louis and St. Louis County governments. The organizers of the merger effort purposefully made that office powerful. But Better Together spokesman Ed Rhode said in a statement that under a new version of the plan set to be submitted to Secretary of State Jay Ashcroft's office, an election will be held for mayor in 2022. Under the original plan, Stenger was set to serve as mayor until the end of 2024. “Over the last two months, we have received strong feedback at stakeholder meetings, public town halls, and on social media regarding the decision to hold the election for Metro Mayor in November 2024," Rhode said. "We listened and we have heard those concerns." Better Together executive director Nancy Rice told the St. Louis Post-Dispatch that the changes were not related to any of Stenger's potential legal problems. She cited Rev. Starsky Wilson's comments to St. Louis Public Radio as one aspect behind the change. Wilson, the CEO of the Deaconess Foundation and co-chairman of the Ferguson Commission, laid out a slew of concerns he had with the merger plan — including its impact on black political power and the decision not to include schools. He also contended it was deeply problematic that the first metro mayor, prosecutor and assessor will be county officials that city residents never elected. Better Together’s organizers have said they picked Stenger because other city-county mergers, such as Louisville, had the person in charge of the larger jurisdiction lead the new government. And Stenger and other Better Together proponents have said it makes sense to have existing officials serve as the leaders of a new government. Rhode said "obviously, this is not a decision you make rashly or quickly." "Rather, we have come to believe over time that the concerns expressed were reasonable, well-taken and needed to be addressed,” Rhode said. Better Together is seeking to get its proposal on the 2020 statewide ballot. It will need to collect thousands of signatures across the state for Missourians to vote on the plan. Send questions and comments about this story to feedback@stlpublicradio.org. On Thursday’s St. Louis on the Air, host Don Marsh talked with St. Louis County Executive Steve Stenger. The conversation touched on the state of the county and recent news concerning the region, including the St. Louis County Council’s attempt to remove him from office, the potential city-county merger and the possible privatization of St. Louis Lambert International Airport. On Tuesday’s St. Louis on the Air, host Don Marsh talked with backers of two competing approaches to a potential reunification of the St. Louis and St. Louis County governments. First up was a conversation with two staff members – Dave Leipholtz and Marius Johnson-Malone – from Better Together, the organization that formally unveiled a much-anticipated proposal for a city-county merger on Monday after several years of study. Following that in-depth interview was a discussion with Pat Kelly, executive director of the Municipal League of Metro St. Louis, which voted Jan. 24 to pursue an alternative route to possible reunification. Creve Coeur Mayor Barry Glantz also joined the conversation. State Rep. Kevin Windham is the latest guest on the Politically Speaking podcast, where the Hillsdale Democrat talked about his first few months as a member of the Missouri House. Windham represents the 85th District, which takes in roughly 20 municipalities in central and north St. Louis County. When he won his seat in 2018 at age 25, he became the youngest African-American man ever to get elected to the General Assembly’s lower chamber. As the Missouri General Assembly hits its week-long spring break, lawmakers are mulling over what they’ve accomplished so far — and bracing for an array of items that haven’t reached the legislative finish line. While lawmakers in both the House and Senate have been able to tackle issues that have historically stalled, such as curtailing the low-income housing tax-credit program, priorities that Gov. Mike Parson holds near and dear have run into opposition from his own party.